This Inspiration Series event is a rare opportunity to bask in the beauty of Urdu, a sweet melodious, language of the Indian subcontinent that lends itself to poetry. Urdu poetry scholar Hamida Bano Chopra will introduce us to the language of Urdu through the work of three of its most accomplished exponents: Allama Iqbal, Faiz Ahmed Faiz, and Sahir Ludhyanvi. Hamida will share these poets' works on love, life and revolution, reciting in the original Urdu language, followed by English translation read by Bay Area poet and teacher of International Poetry, Zack Rogov. Hamida Bano Chopra a graduate degree in Urdu from Aligarh University, and a M.A. in Philosophy from Udaipur University, both in India. 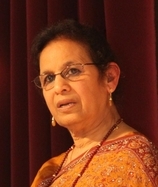 She has lectured and taught Urdu language, poetry and literature at universities and educational centers in India and the U.S., including the Indian Institute of Technology in Gujurat, University of California at Berkeley, and Chico State University. Zack Rogow is the author, editor, or translator of nineteen books or plays. His seventh book of poems, My Mother and the Ceiling Dancers, was published by Kattywompus Press. He is the editor of an anthology of poetry of the U.S.A., The Face of Poetry, published by University of California Press. His cotranslations of Urdu poetry have appeared in Metamorphoses, Two Lines, and are forthcoming in World Literature Today. Currently he teaches in the low-residency MFA in writing program at the University of Alaska Anchorage.